Address; Peter Posh Formal Suit Hire, 10 Vanguard Way, Battlefield Enterprise Park, Shrewsbury. SY1 3TG. Wedding Car Hire in Shropshire. Address; Route 66 Wedding Car Hire, 19 Rosthwaite, Wellington, Telford, Shropshire. TF1 1HX. Route 66 Wedding Cars is a family run business with many years of professional driving experience offering an American Cadillac Fleetwood or a Silver Jaguar XJ6. Route 66 Wedding Cars also offer executive private hire transporting bridesmaids, mother of the bride, airport transfers and private chauffeur hire. 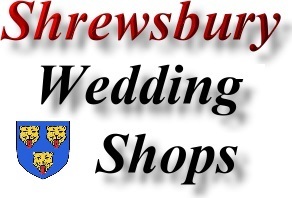 Address; Tiara Store Wedding Accessories, The Manse, Shrewsbury Road, Hadnall, Shropshire. SY4 4AG. The Tiara Store is a mail order only wedding Accessory Company. Please note that there is no Wedding Accessories shop onsite.